Many dogs become deaf over the course of their life, as a result of old age, chronic ear infections or injury. But did you know that, like people, some dogs are born deaf? This is known as congenital deafness. 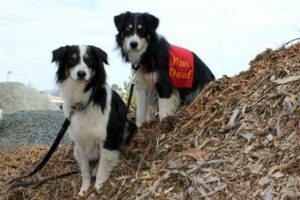 Deafness is not a condition pet owners should be afraid of, although when it comes to approaching a deaf dog, you should always exhibit special care and caution. Always approach a deaf dog from the front where they can see you, not from behind. Deaf animals have a tendency to be startled easily, and that can often result in a bite as an instinctual defense mechanism. Ensure that the dog sees you before you touch him. A good way to get his attention is to stomp on the floor. He will feel the vibration and react to it, giving you the opportunity to safely continue the meet and greet process. Always allow the dog time to “sniff” you: this will begin building a bridge of trust between you and the dog. Once you have the opportunity to touch the dog, like any other dog he will be your new best friend, showing love and affection. Deafness in dogs does not mean that they can’t be trained, simply that they must rely on their other senses to learn commands. Since they can’t hear you, they compensate by being very observant. Because of this, deaf dogs tend to be quick learners paying close attention to their owner’s movements and visual cues. It may be in your and your dog’s best interest to take special dog training classes together that focus on hand signals instead of verbal commands. 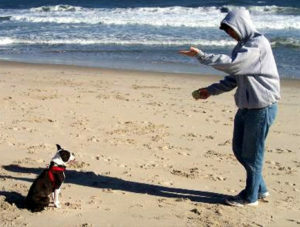 Just be aware that a there will be ups and downs, just as there are with any dog that goes through obedience training.